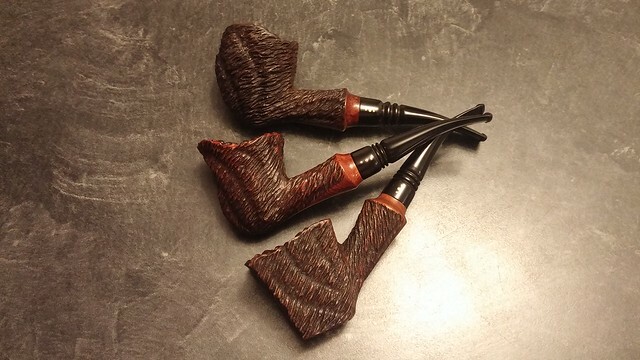 They say life happens in threes, and I’m inclined to believe them, especially when it comes to my collection of vintage Brigham pipes. 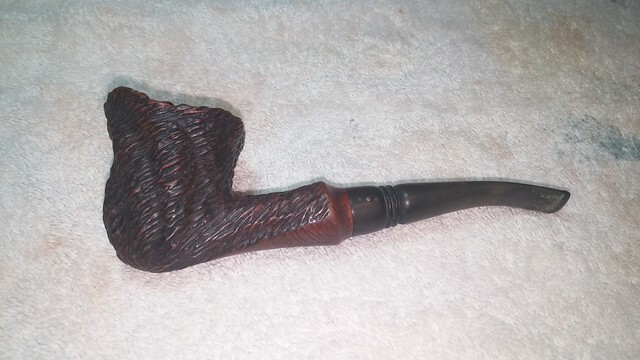 Not long ago I wrote about finding and restoring a pair of late 1970’s Brigham Norseman pipes, the first of that series to cross my path. 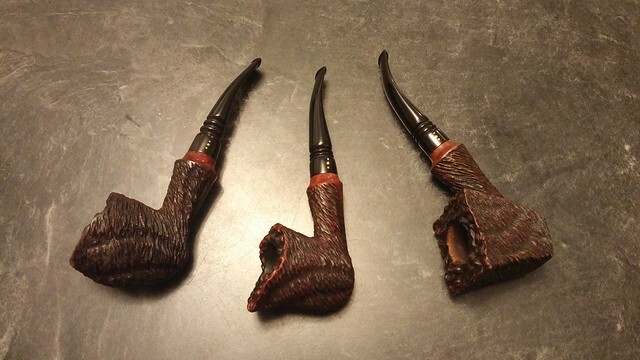 The Norseman pipes were the rusticated brothers of the Brigham Valhalla series pipes; both lines, which shared the same six shapes, were produced in the 1970’s as Brigham’s response to the Danish pipe craze of that era. 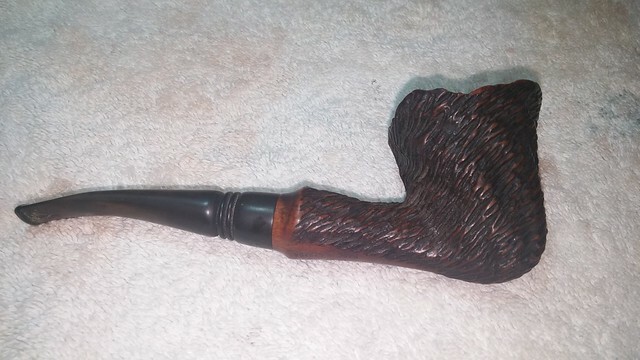 Having almost literally tripped over the first pair of Norseman pipes in shapes 9W4 and 9W7, I was thrilled to spot a recent eBay listing for a third example of the line, in yet another shape – a 9W5. Girding myself for online auction battle, I loomed over my laptop during the final minutes of that auction! 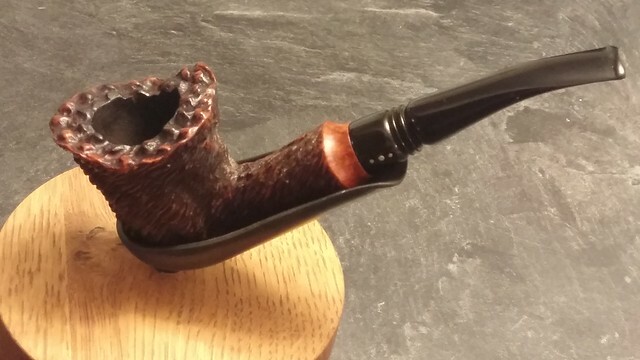 My perseverance paid off – I won the auction and before too long a parcel arrived containing the much-anticipated pipe. 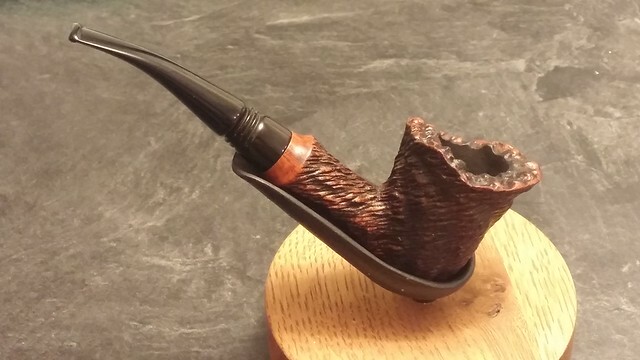 The 9W5 shape is a vaguely Dublin-esque bent pipe, with a more or less conical bowl and a wide plateau rim. 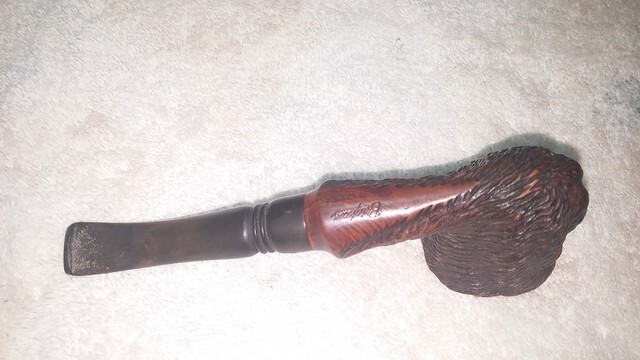 The pipe when it arrived was dirty, with dust, grease and gunk stuck in the unique diagonal rustication typical of the late 1970’s Norseman pipes. The plateau rim was choked with lava, although the bowl had only a mediocre amount of cake. 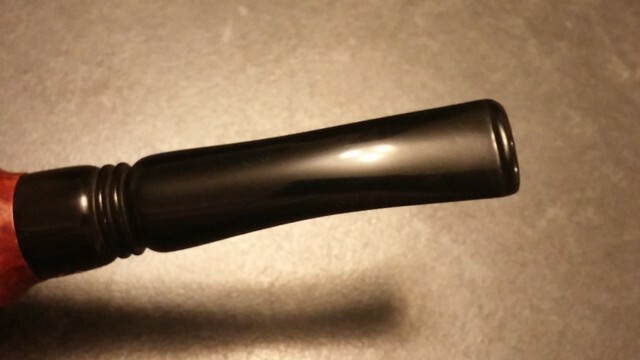 The stem is original and carries the three horizontal pinning pattern originally used for the Brigham VIP pipes, in which the centre dot is larger than the flanking pair of pins. 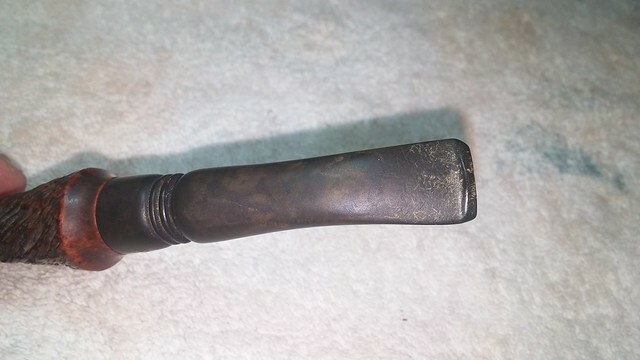 The pipe’s stem was oxidized and carried a fair amount of tooth chatter, though I couldn’t see any large dents or other damage. 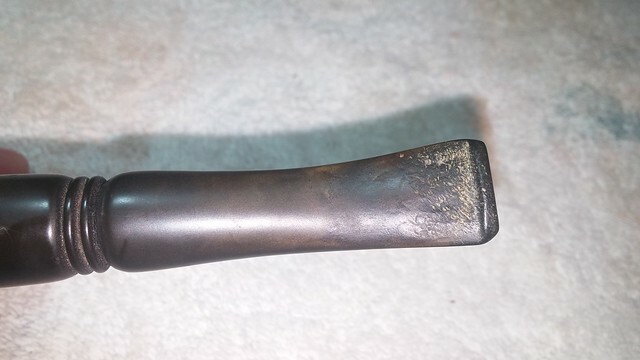 Overall, the pipe looked to be in decent shape. 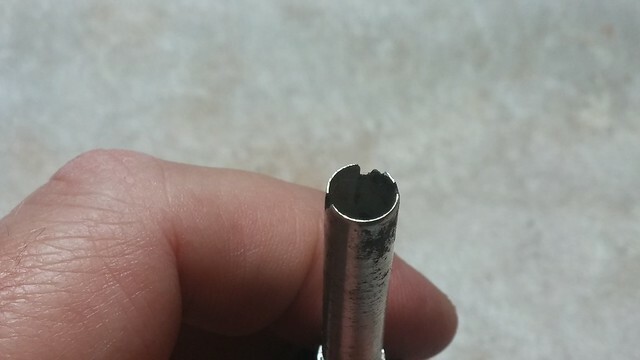 The only real damage is to the end of the aluminum tenon/filter holder, which looked a bit moth-eaten due to corrosion; a Brigham rock maple filter still fits snugly in the aluminum tube, though. 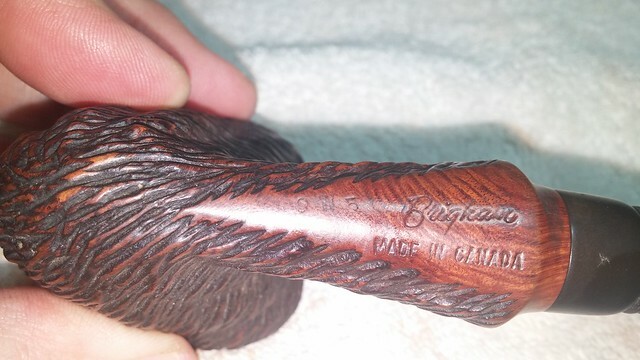 As most of the late-70’s Brighams, this Norseman is stamped “Brigham” over “Made in Canada” beside the shape number, “9W5”. The first two stamps are in excellent shape, crisp and well-struck. The shape number stamp is a little more lightly struck, but still in very good condition. I reamed the cake from the tobacco chamber with a combination of Castleford reamer, sandpaper and pen knife. 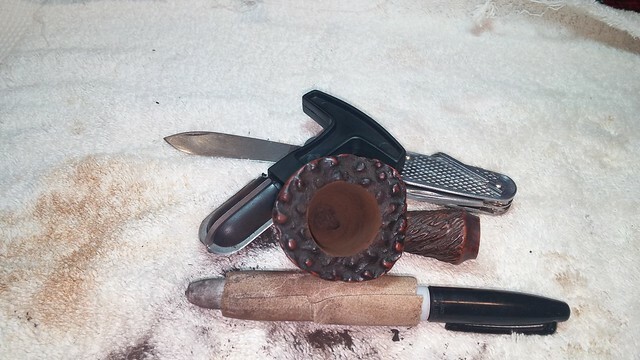 The chamber is deep on this pipe, and conical in shape, so I needed all the tools in my arsenal to clear the cake without digging into the briar. Underneath the cake, the chamber was in excellent shape, with no burns, cracks or gouges. 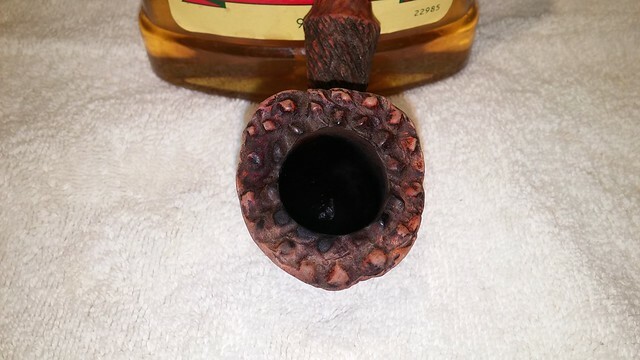 I dropped the stem into a bath of Oxyclean and warm water to soak while I worked on the stummel. 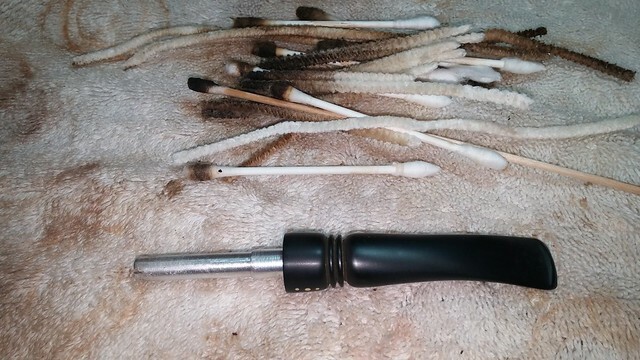 A few pipe cleaners and cotton swabs dipped in alcohol cleared the residual tars from the mortise and airway. 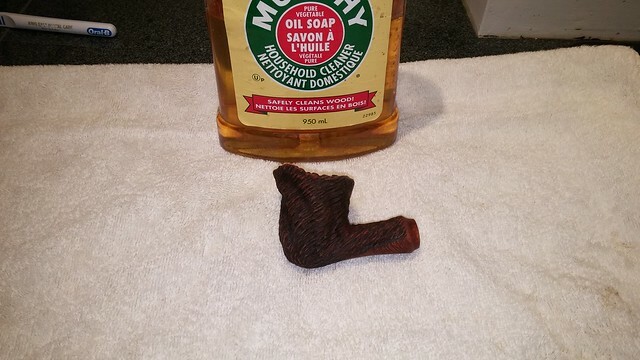 Murphy’s Oil Soap and a toothbrush made short work of the dirt and oils trapped in the rustication. I also gave the plateau rim a good scrub with the Murphy’s while I was at it and managed to lift all the lava and tars collected there. 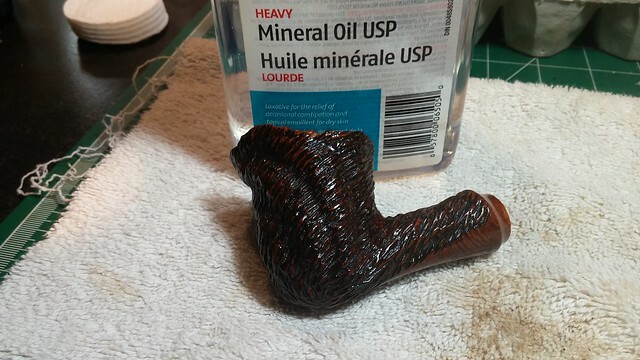 The finish on the stummel was in good shape under all the dirt. 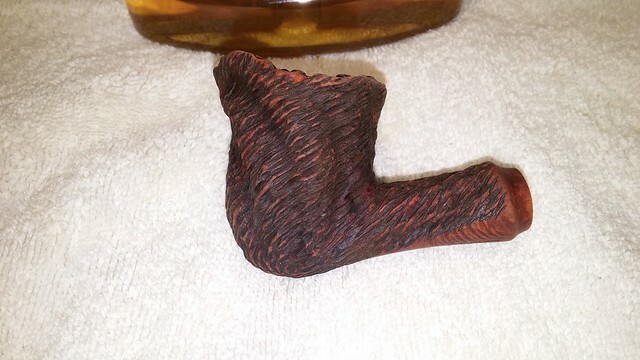 I wouldn’t need to re-stain the briar; a wipe with mineral oil moisturized the wood and refreshed the finish. 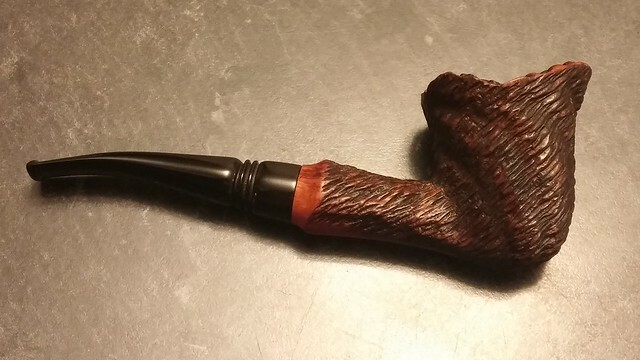 With the stummel ready to go, I moved on to cleaning the stem. 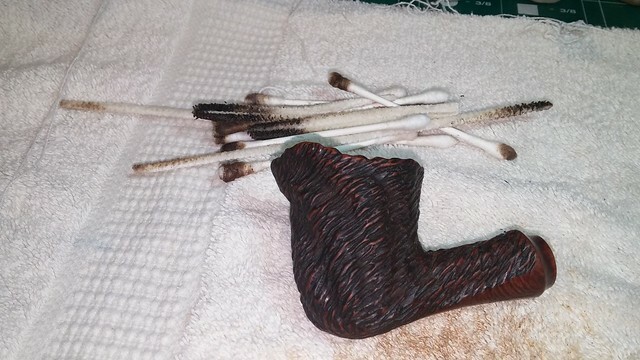 I pulled it from the Oxyclean soak and scrubbed away the loose oxidation and grime with Magic Eraser before using a fair pile of pipe cleaners and cotton swabs cleaning the collected gunk from the stem’s airway. 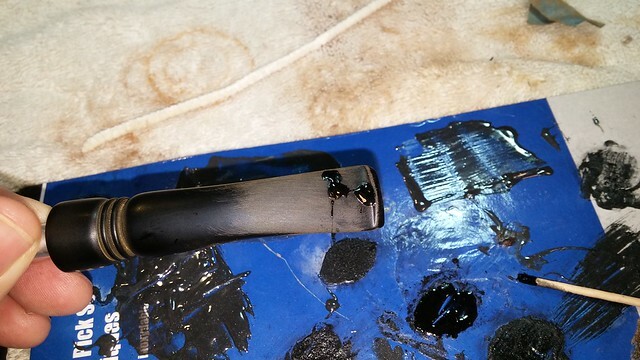 These stems tend to collect quite a bit of crud inside the aluminum filter holder if they are smoked without a filter in place. 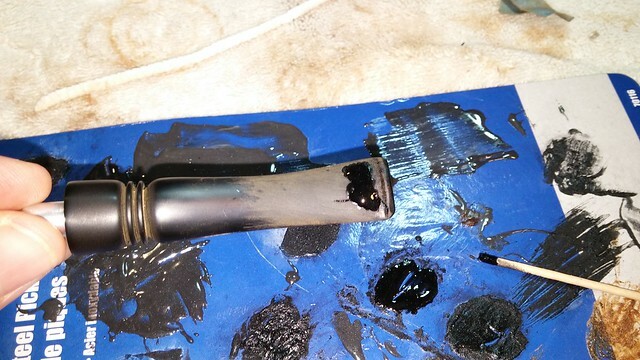 I smoothed out most of the tooth chatter on the bit with 220-grit sandpaper and then dripped CA glue mixed with charcoal powder into the deeper marks. 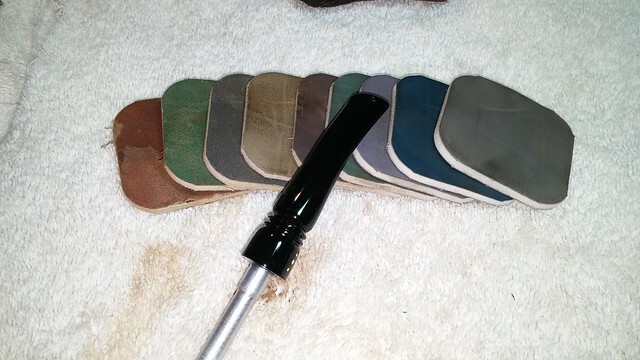 I overfilled the dents to make sure there was enough material to sand smooth when the glue cured. 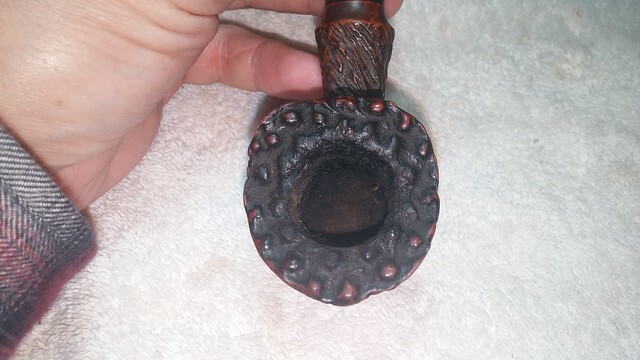 When I had the fills smooth and even, I erased the sanding marks and polished up the stem with a full course of Micromesh sanding pads in 1500-12000 grits. 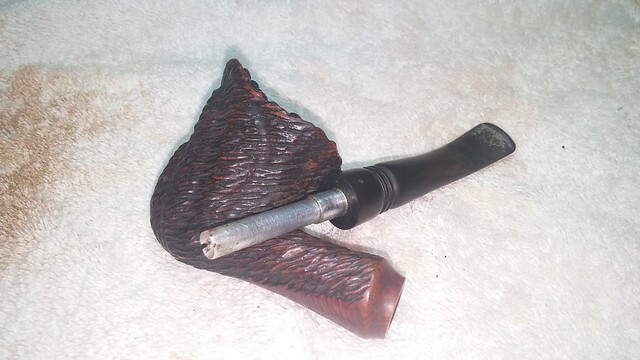 I wet-sanded with the first three pads and dry sanded with the remaining grits, finishing off the stem with a wipe of mineral oil. Then both stummel and stem were treated to a light buffing with White Diamond compound on the wheel and a few light coats of Carnauba wax. 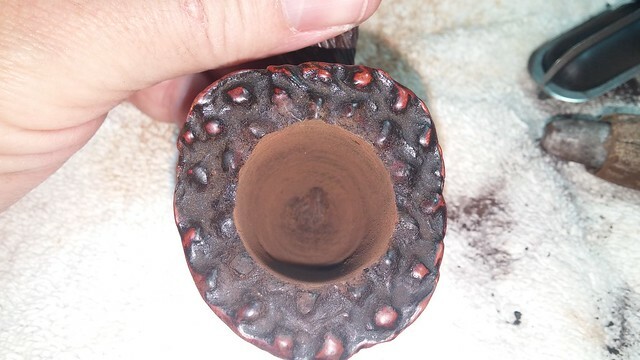 The diagonal rustication pattern on the briar made it easy to avoid catching excess wax in the low spots, as I could angle the stummel against the wheel to allow the cotton to sweep the grooves clean with each pass. 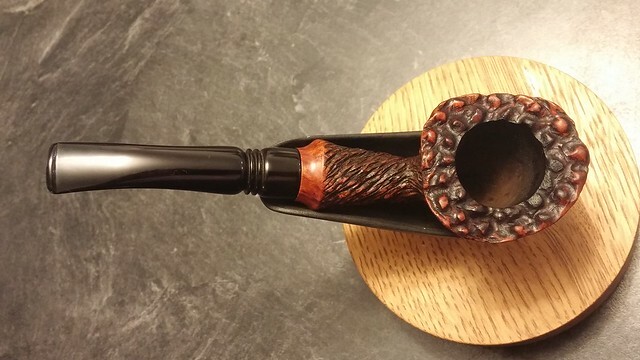 This Norseman 9W5 is now ready to take its place alongside its brother pipes in my collection. With three of the six Norseman/Valhalla shapes now represented in my rack, I’m keeping my eyes peeled for the remaining three shapes (9W2, 9W3 and 9W6). 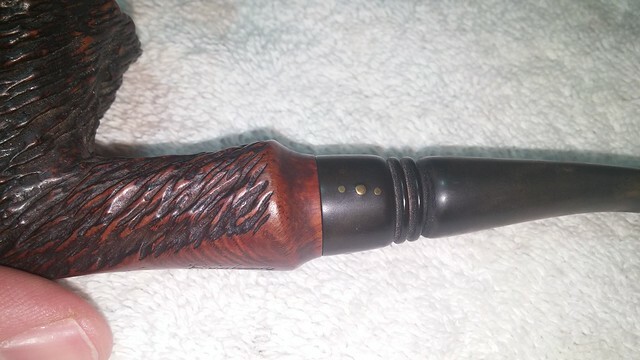 Here’s the finished pipe, and a few pics of all three of my Norseman pipes together. Thanks for looking, and until next time, Happy Piping! Congratulations! That bowl WAS in mint condition, amazing! Thanks, Al. I’m thrilled to add this one to the collection. Now REALLY looking for the other shapes in the series! 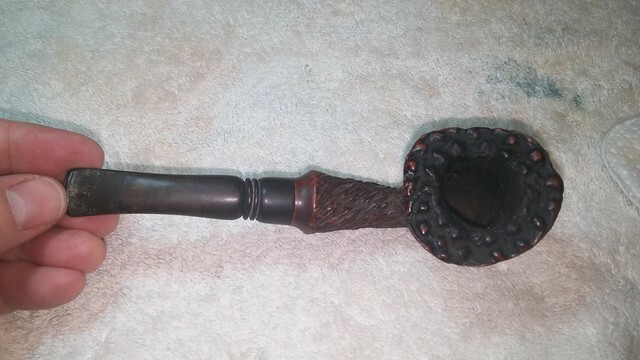 This pipe is a real looker! And I bet it sits in your hand like it was made just for you. 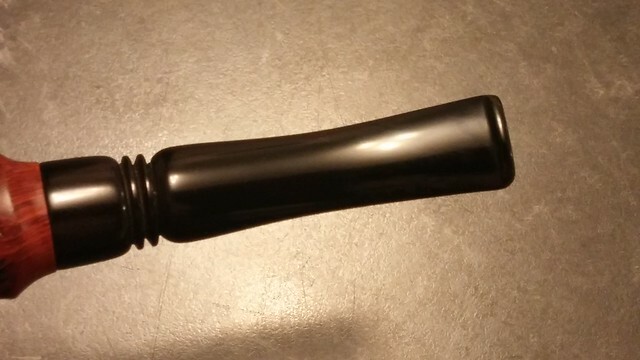 I have two pipes with the similar aluminum filter holders and I can attest to the difficulty and pull-your-hair-out moments in giving it a proper scrub. But great work, as always. Sorry. These aren’t for sale. 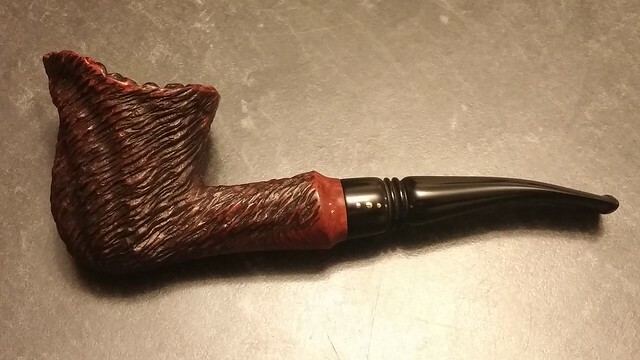 Available pipes are listed in the DadsPipes Store at dadspipes.ecwid.com. Thanks for looking.